In the gallery a wire rack of oil cans sits. 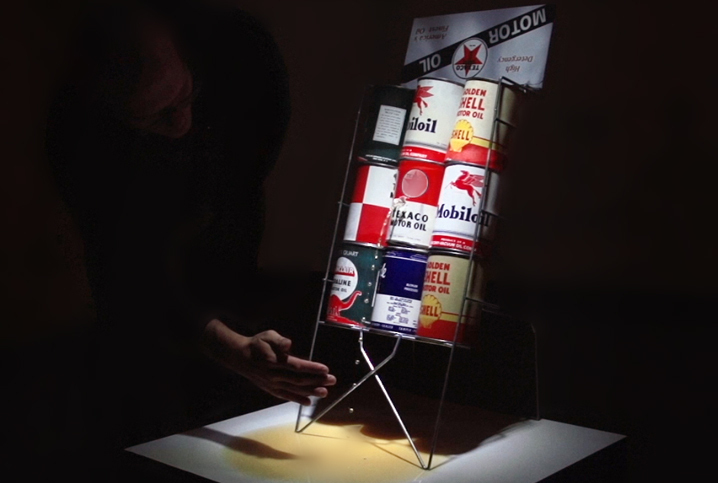 One oilcan has a visible fissure out of which oil slowly flows cascading onto the pedestal and gallery floor… The only thing is, the oil isn’t exactly flowing out of the can. Instead, oil appears to slow slowly drop by drop back into the can. At times the drops of oil hover unsupported in midair. Other times the drops are in the process of a slow motion splash onto the pedestal. Supermajor installation at Katzen museum in Washington D.C.